Like many Goshen College students, fifth-year senior Alli Hawkins completed her Study-Service Term in Nicaragua the summer before her junior year. Unlike many students, however, since leaving the country just over two years ago, Hawkins has already returned once and will return yet again on November 17th for the wedding of her host sister, Rosaly. Lead by Professor of Chemistry Doug Schirch and his wife Maria, Hawkins’ SST in the summer of 2008 lasted 12 weeks. Following the general SST format, Hawkins spent the first six weeks studying in a city called Jinotepe and the last six weeks on service in­­­ Jinotega, a town in northern Nicaragua. It was very nerve-racking for Hawkins to meet her Jinotepe host family for the first time but she said she felt an immediate connection with her youngest host sister, Anita, who attached herself right away to Hawkins. “She clung to me, and that made me feel loved,” Hawkins said. Walking into a family in which she didn’t speak the native tongue was a challenge for Hawkins at first. However, her classes and constant immersion in the culture helped to increase her Spanish comprehension, which also helped to further develop her relationship with her host family. Communicating through basic questions such as “How are you?” did not hold the relationship back because to Hawkins, actions are what really matter. “Hosting me repeated times when I visit, feeding me, picking me up at the airport, and calling on birthdays and holidays makes the relationship seem more real and more connected than just talking,” Hawkins explained. The constant language barrier made it hard for Hawkins to communicate past a surface level but she attributes their strong relationship to the family’s immense hospitality towards her. “Their unconditional concern for my well-being was unbelievable. They had just met me one week ago and wanted to make sure I was well-fed, and my mom walked me to school everyday,” Hawkins said. Hawkins return trip to Nicaragua next month will not be her first as she, along with fellow SST-er Anna Srof (’10), visited their host families for two weeks over Christmas vacation last year. On Hawkins’ trip next month, however, her mother, Cindy Bontrager Hawkins, will join her. 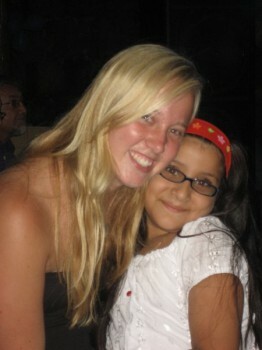 It will be Cindy’s first visit to Nicaragua and Hawkins will be the translator, as Cindy doesn’t speak any Spanish. Hawkins is looking forward to sharing this big part of her life with her mother. “It will be a lot of culture shock for my mom but as soon as she meets my family it’ll be fine. She’ll love them and they’ll love her,” she said. While Jinotepe may be a culture shock for her mother, Hawkins considers this trip almost as a return home. She compares reuniting with the Cuadra-Marenco family to merely catching up with any other family that she doesn’t see very often, simply in a different language. “The way they treated me from the beginning was like being their real daughter,” Hawkins said. Staying in contact with both her city and service host families from Nicaragua is important to Hawkins. She believes that a lack of confidence in language skills is the main reason many students may not stay in touch with their SST host families. Hawkins calls her host families regularly, usually three times a semester. She admitted she gets nervous about her Spanish skills before each phone call, and how her speaking and comprehension have diminished since she left Nicaragua. Hawkins insists that just making the effort is the most important part. “You just have to put yourself out there even if you barely understand,” she said. Not wanting to become disconnected from the people she met in Nicaragua is the reason why Hawkins has returned already. “If you don’t go back right away you start feeling that disconnect and it’s not as urgent,” Hawkins said. Her SST experience in Nicaragua has only increased Hawkins’ view of international travel and hospitality between cultures. “SST provides great opportunities to build those relationships even if it isn’t with your host family, but with people around you,” Hawkins said. Her experience in Nicaragua has also made her want to host an exchange student sometime in her life to repay the warm and loving hospitality that she received in Nicaragua. “There was no reason for [my family] to give me such love and care, they just did,” Hawkins said.